“Stem Cell Therapy is the next generation of how we can help dogs with osteoarthritis. It is the wave of the future when it comes to adding quality years to our pets’ lives,” says Dr. Michelle. STC technology has been studied significantly in horses and dogs, with thousands having been treated and progress monitored. Let’s say your pet has osteoarthritis in the hips making it painful to walk. 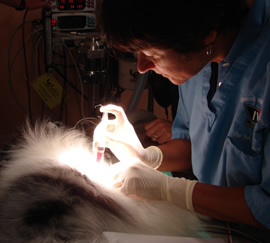 If your pet is a candidate, one or two small incisions will be made to remove a few grams of fat. The fat is then processed in-house to remove the stem cells. Those cells are injected into the hip joints, and some may be injected systemically to address mild arthritis in other areas of the body. The stem cells can differentiate into many tissue types (like cartilage in this case), trigger the body’s repair mechanism, reduce inflammation and stimulate regeneration of the cartilage. Using SCT to treat osteoarthritis is just the beginning. It is also currently being used to treat cartilage damage, fractures, ligament and tendon damage. Research is also underway to evaluate the use of SCT to treat degenerative myopathy, irritable bowel disease, immune mediated diseases and various cardiac, liver and kidney conditions. 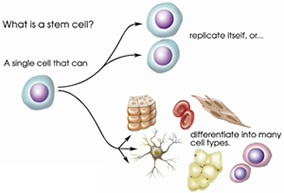 Despite the wide array of applicable conditions that SCT can be used to treat, it is beautiful in its simplicity. It is the patient’s cells healing the patient, and since the cells come from the patient, there are no issues with rejection. Can SCT help your pet? Check with one of our Loving Touch veterinarians.